What are 4 Point Inspections, and why do you need to get one? When you are buying a home, many different professionals will likely be examining your home for a number of reasons. One of these people will be a home inspector, who will perform a variety of different inspection services for your home. One of these inspections, which most people are not familiar with, is called a 4 Point Inspection. A 4 Point Inspection focuses on the 4 major components of your home. 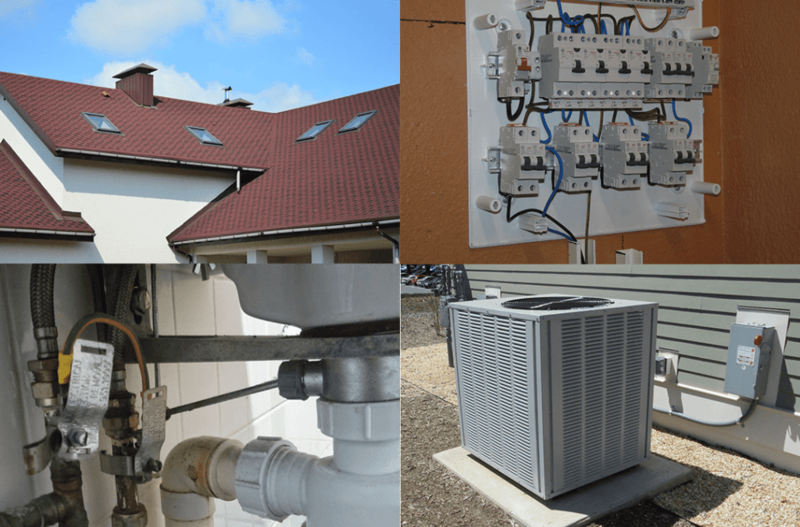 The 4 points that are inspected are the roof system, the electrical system, the plumbing system, and the HVAC system. A failure in any one of these systems nearing the end of their life could cause both major and minor problems. Many insurance companies will require that a 4 Point Inspection be performed before they will provide homeowner’s insurance, especially when the home is over 25-30 years old. What’s Involved in a 4 Point Inspection? Scheduling your 4 Point Inspection depends on the renewal date for your policy. The basic goal of a 4 Point Inspection is to assess the condition of all of the included systems. The inspection is meant to determine if everything is installed and operating correctly, and also to assess the remaining functional life of the components. When the home inspector inspects your roof, he or she will look for things like missing roof shingles, defects, patched repairs, evidence of leakage, premature aging, and aging materials. For the plumbing system, the inspector assesses and documents the accessible components of the system. He or she will take photographs of the water heater, the plumbing connections underneath each of the sinks, the washing machine, connections, and hoses. The inspector also determines the type of plumbing system and looks for evidence of leaks, missing components, rusting along pipes, and the type of piping. As for the HVAC system, it will be looked at in terms of electrical supply and its ability to heat and cool the house. For the electrical system, the inspector will determine the amperage of the home. He or she will take pictures of the opening of the electrical panel, looking at the type of wiring and the wiring requirements for the home, and evidence of any special hazards that are visible. If possible, he or she will review the grounding system as well. Most people don’t realize that repairs or updates are needed until after a 4 Point Inspection, making this inspection also popular with sellers who wish to avoid any last minute surprises with the sale of their home. The kind of information revealed in a 4 Point Inspection enables the homeowner to make any necessary fixes and be that much closer to insured homeownership, or a smooth closing on his or her home. Lakeland Home Inspection Service offers 4 Point Inspections for Lakeland and central Florida, along with a variety of other inspection services such as Wind Mitigation Checkups, which often help you qualify for a discount on your homeowners insurance. Please contact us with any questions or to schedule your inspection today!